I just got back from participating in the annual fall MO CASE conference. One of the best parts of my job as executive director of the Council of Administrators of Special Education is getting to participate and support our 41 CASE affiliates/subdivisions! I try to go to about 6 a year and it is always such an amazing experience! I get to meet new people, hear great keynotes I can then pass on to others, share experiences and sometimes help a unit find solutions or make vital connections! I am able to catch up on what the unit is doing and pass that on to others! Missouri Council of Administrators of Special Education is busy building connections and developing some significant work on their major goal — ReInvention of Special Education. They are busy building coalitions and collaborations. They are very intentionally working to raise the achievement of all students while lowering the gap between subgroups. President Steven Beldin and Executive Director Terry Allee are to be commended for this beginning of a great work! We also know several other states are also working on crafting changes at the state level on what special education should look like in the near and far future. Colorado really began this work several years ago, California and Michigan are other states that are working on similar initiatives. If you know of work in your state, please contact CASE policy and legislative chair, Phyllis Wolfram so we can continue to learn from each other! I am always so excited when I hear from folks about my opening article! I never know if people are really reading our update or not — when I get a comment, I know at least that person did! 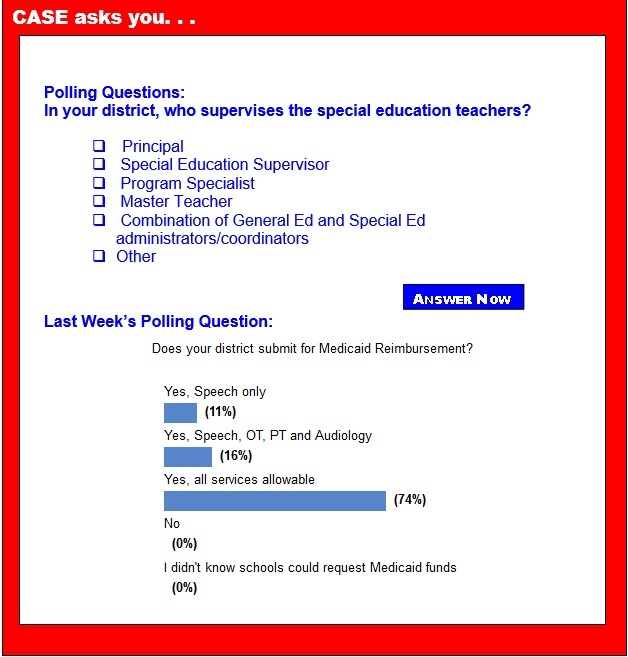 I got quite a few comments last week about Medicaid in Schools and on Telepractice in speech. One reader sent me a white paper on Telepractice in Medicaid. It is sponsored by a vendor but I believe it can be a resource for many of you. Have you checked out the amazing CEC District Membership option? For $1,300 you get a Premier membership, 5 basic memberships, 2 conference registrations and 3 webinars ... plus all you get with those Premier and Basic memberships! This represents a $300 savings! Click here for the district membership brochure, click here for the FAQ on this option and click here for the application! Add noreply@directvote.net to your email account's list of trusted senders. CEC has partnered with Survey & Ballot Systems to administer the 2015 election. To ensure your electronic ballot email arrives safely in your inbox and not in your spam filter on Sept. 29, "white-list" this CEC Election Coordinator email address. Visit CEC's website to familiarize yourself with the candidates' biographies and qualifications. Verify your contact information to be sure you receive your e-ballot. You can update your profile via your Member Resources Hub at www.cec.sped.org. Vote online! It's fast, easy and green! Your Vote = Your Voice! Speaking of Your Voice! Using your suggestions and your colleagues vote, Professional Development Chair, Will Gordillo has put together an amazing program for our CASE members for the 25th Annual CASE fall conference! Our three keynotes will definitely inspire you but they also will provide you with a wealth of practical tools you can use in your everyday work ASAP. Drs. Stevan Kukic, Randy Sprick, and Frances Stetson will totally blow you away with the quality of their presentations! I have heard each of these 3 professionals on many occasions and I have always left with new ideas, new tools and a feeling that the job I do is important and necessary! The 30+ breakout sessions are also full of practical, evidenced based information. Click here for a list of the breakout sessions. If you want to learn what's new, connect with your colleagues from around the U.S. and Canada, and experience some quality professional learning that is both inspirational and content laden, then join us in San Antonio Nov. 13-15! Registration is up at www.casecec.org. We still need more input on the Paperwork "issue" ... I have asked for your thoughts and comments on the ever mentioned problem of "paperwork." CASE needs specific examples of what local districts/states have done to make a dent in this issue. If you have checklists, or processes that have helped with this issue and specifically have improved the issue for your teachers, please let us know and send some of the examples to lpurcell@casecec.org. On Thursday, Sept. 18, 2014, the Senate passed H.J.Res.124 - Continuing Appropriations Resolution, 2015 that authorizes appropriations for FY 2015 through December 11, 2014 at the FY 2014 enacted levels and clears it for the president's signature. Recently, the Council of Chief State School Officers and the National Policy Board for Educational Administration released draft standards for education leaders, and they're seeking the input of leaders in the field. The Department of Education is a great place to explore fields like education policy, research and analysis, intergovernmental relations and public affairs, or traditional and digital communications, all while learning about the role federal government plays in education. Is the resource room a waste of time? Recently, I read a Facebook entry written by a parent of a student with learning disabilities. The parent said, "The resource room is a waste of time for my child." The comment took me aback. I began to wonder if my work with students was a waste of time. I thought about my resource room and the students I have served there. I questioned the curriculum and teaching methods I have chosen and used. I thought about the years that some students spent in the resource room, as well as the students who have been successful and left special education and my resource room. I decided that I agreed with the parent. Though headlines have blared about violence on the yellow bus just weeks into the new school year, school officials affirm that anti-bullying programs are making a difference for students across the nation. School districts in Minnesota reported seeing positive results from PRIDE and Olweus bullying prevention programs that were implemented within the prior school year, and last spring the state passed a new anti-bullying law that calls on public schools to follow suit. As if we needed more proof that taking away recess is a counterproductive punishment, a new study indicates that exercising every day can actually help ADHD children focus better in class. The study, recently published in the Journal of Abnormal Child Psychology, selected 202 children between the ages of 4 and 9 — about half of whom were "at risk" for ADHD. The students were randomly assigned to either 31 minutes of vigorous physical activity before school or 31 minutes of a sedentary classroom activity, like completing an art project. The study lasted for 12 weeks. Rep. Steve Israel, D-N.Y., is the latest member of Congress to introduce a bill that would significantly shrink the federal footprint on standardized testing. The Tackling Excessive Standardized Testing Act, introduced with the backing of the American Federation of Teachers, would allow states to choose an alternative testing regimen for students in grades 3 through 8. According to the Institute of Education Services, there are about 100,000 public schools in the United States as of the 2010-2011 school year, which is a jump from the 85,000 seen in 1980. The Institute also found that there are 3.7 million full-time Wikimedia Commons teachers in the United States, as of fall 2012. This is up from the reported 3.4 million American teachers as reported in 2002, the Institute explained. When Danville Independent Schools in Kentucky overhauled its curriculum in 2009 to focus on 21st century skills, district leaders quickly realized they faced an assessment challenge: How would teachers objectively and systematically measure the development of skills such as teamwork, initiative and perseverance? Because such complex thinking skills can't be measured by traditional standardized tests, educators nationwide are turning to new ideas like "stealth assessments" hidden in video games and student roundtables that work like college dissertation defenses. Parents go to great lengths to meet the special and often demanding needs of children with disabilities. In Diana Diaz-Harrison's case, that meant opening a charter school in Phoenix for her son, who has autism — and for other students like him — when she felt his needs weren't being met in regular district-run schools. "For my typical daughter, we chose a charter school that specializes in the arts ... that meets her needs," said Diaz-Harrison. Should schools be responsible for kids' health? There's a section in the new Phi Delta Kappa/Gallup Poll out this week that hasn't gotten much attention: what parents think about schools and student health. Interestingly, the percentage of parents who said they "strongly agreed" their child's school "does things to help him or her be healthier" has declined since 2012, to 20 percent from 33 percent, according to the new poll. While keeping in mind that correlation is not causation, the steepness of that dip took me by surprise. The role of schools in keeping kids healthy has been in an intense spotlight for the past four years, both with the push to improve federal school nutrition requirements and the intensity of first lady Michelle Obama's "Let's Move" campaign. Parents go to great lengths to meet the special and often demanding needs of children with disabilities. In Diana Diaz-Harrison's case, that meant opening a charter school in Phoenix for her son, who has autism — and for other students like him — when she felt his needs weren't being met in regular district-run schools. As the new school year ramps up, teachers and parents need to be reminded of a well-kept secret: Across all grade levels and academic subjects, girls earn higher grades than boys. Not just in the United States, but across the globe, in countries as far afield as Norway and Hong Kong. This finding is reflected in a recent study by psychology professors Daniel and Susan Voyer at the University of New Brunswick. The Voyers based their results on a meta-analysis of 369 studies involving the academic grades of over one million boys and girls from 30 different nations. The findings are unquestionably robust: Girls earn higher grades in every subject, including the science-related fields where boys are thought to surpass them. Teachers, make this your year to make better use of rubrics and a rubric scale for your assignments and your courses. A rubric is a chart that lists the criteria and a variety of levels that describe proficiency for a particular assignment or task. When used correctly, rubrics can greatly improve the accuracy and consistency of a student's grade because they establish clear expectations for students on what they need to do to demonstrate mastery on an assignment or throughout a course. An early established fear of failure at school can influence students' motivation to learn and negatively affect their attitude to learning. This is the finding of a study by Dr. Michou, (Bilkent University, Turkey), Dr. Vansteenkiste (Ghent University, Belgium), Dr. Mouratidis (Hacettepe University, Turkey) and Dr. Lens (University of Leuven, Belgium) that will be published in the British Journal of Educational Psychology. Human tutors — teachers who work closely with students, one on one — are unrivaled in their ability to promote deep and lasting learning. Education researchers have known this for more than 30 years, but until recently they haven't paid much attention to one important reason why tutoring is so effective: the management of emotion. Studies show that tutors spend about half their time dealing with pupils' feelings about what and how they're learning.